When I did Anni Daulter’s Sacred Goddess Retreat and came away with my own Red Drum I felt as though a door had been opened to another world of possibilities for me. I have always been fascinated with Goddess archetypes, mythology, and theology, from a very young age, but coming away as a drum carrier was not something I’d entirely expected. I have never been a particularly rhythmic person, drumming was never my forte, but after learning about the history of drums as a ceremonial object, as a way to bring forth the heartbeat of the Mother for the purpose of ceremony, I felt deeply called to continue to work with it. To me a leader in the movement back towards a more wholistic view of the world, particularly one where the Goddess is revered as much as the God, is often seen as a High Priestess. A woman who has fully committed to being a person who stands up in front of others and helps to raise the collective vibration of a large group of people. While perhaps someday this will be where I end up, this isn’t where I am right now; in fact I don’t even see it as my end goal. I often feel that a big part of my work in this world is not necessarily to be a leader in the sense of being one who is always in charge, but rather as someone who is walking down a path that I’m exploring myself for the first time, and taking people along with me and encouraging them to become leaders. I don’t feel as though this is a path I have treaded for any length of time. In fact I feel a fledgling in this work compared to the people who I have looked to for guidance and inspiration my whole life, but I do feel strong in my call to the connection to the work; I also feel that by being as open about my own exploration as I can, it will call forth others for whom this work also speaks. I see myself as standing in my small corner, doing what I am doing, inviting any who come along my path to sit in circle with me, to talk to me, and share what they too have to say, to ask questions of each other, and to learn from one another. 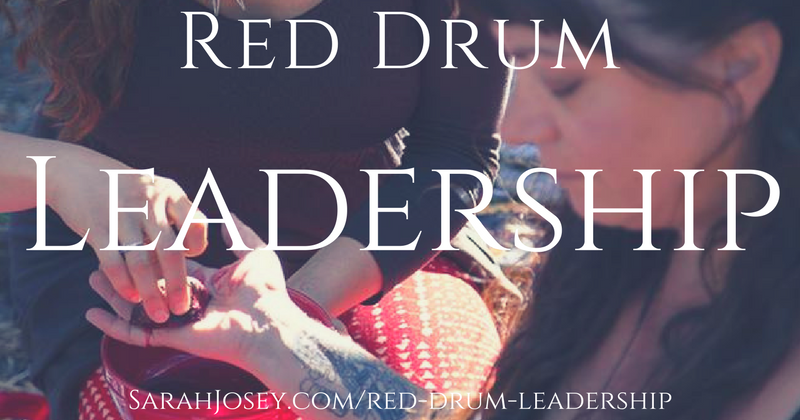 My hope and intention behind becoming a Red Drum Leader is that it will push me beyond my current comfort zone; it will test my own limits so that I can grow from the experience, and then perhaps help others along the way. I imagine that it will be some time before I feel called to lead my own Red Drum Retreat; I have years of work to do with my own drum before I think I will be ready for that, but in preparation for that day, today I am taking this step, knowing it will force me into growing a little bit more, and perhaps someday I will be ready to take others down this path.